We keep developing our concept based on crowd sourcing, focused in a Open Space for interaction and exchange, discussion, collective learning and download. Therefore we keep an open call and invite you to join us. We are interested in curating one exhibition under the topic “Relational Art & Open Space”, workshops, talk sessions, lectures, performances, one Pecha Kucha night and anything you could think of and we didn’t mention. Please send photos or videos of your project as well as a description of what would you like to do during the time the Open Space is available. * All production will be developed under Free licenses. * It is a condition to participate in the dynamics of the Project as a whole, participating in a regular way in the different work schedules, maintenance and attention to public. * If you find yourself in any situation where you are neither learning nor contributing: Give greetings, use your two feet, and go do something useful. Responsibility resides with you. 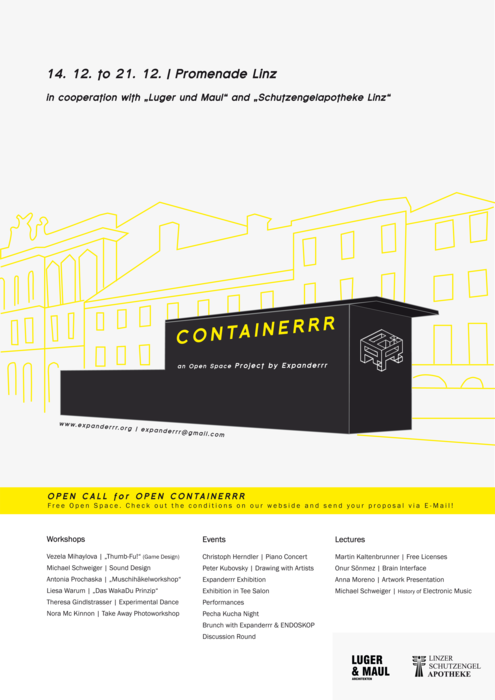 Everyday we will Open the Containerrr for two to three hours to host interesting activities proposed by anyone who is keen to use the space we offer. Tuesday 20th: 11:00am to 16:00pm. We will hold a curated exhibition under the topic: Relational Art & Open Space. Opening Exhibition on the 17th of December at 19pm. Open distribution of exhibited and generated material. 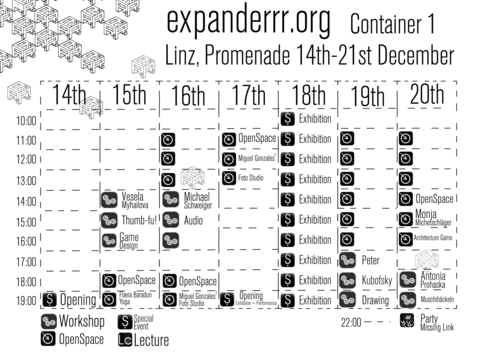 15% comission of the art sales will go towards the working costs of Expanderrr. 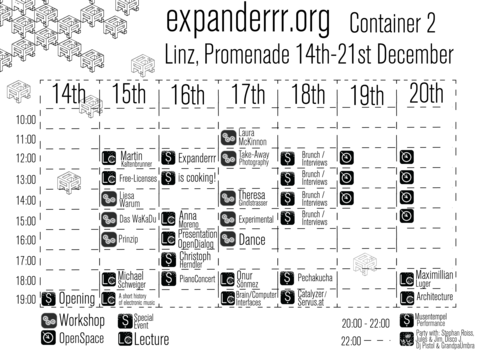 The project will take place in the three containers in Promenade, Linz. From the 14th to the 21th of December 2011. To anyone interested in participating, Hello world!